This is a draft of the installation instructions. Please send us an email at moc.elitkkat|maet#moc.elitkkat|maet if something requires clarification. The finger boards shape was designed such that it would match the shape of the fingertip. 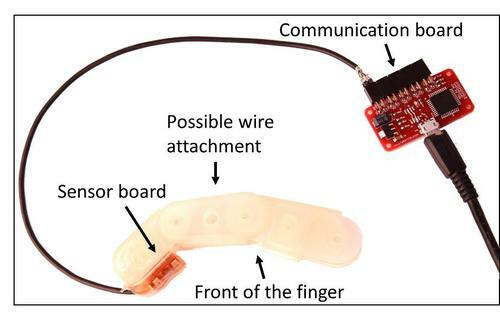 The wire should go on the back of the finger and connect to the communication board. The sensors are provided with double sided tape. We would recommend using superglue to attach the sides of the rubber to the fingertip for increased protection. The wire from the sensor should be placed on the back of the finger. The palm board was supplied with double sided tape for attachment. Place the sensor into its position on the palm, and press firmly to secure. 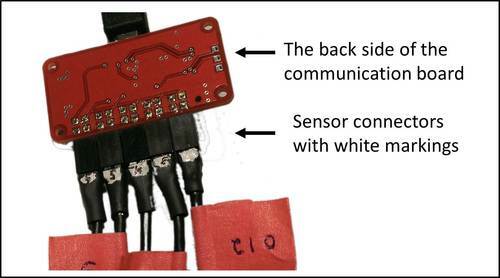 The board can be also attached using two M2 screws as indicated on the figure below. 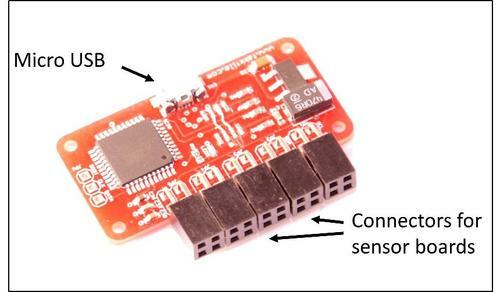 Sensor connectors have polarity!. The white marking on the sensor connector should be towards the back side of the communication board. The example is shown in the figure below. When they are plugged in, the LEDs in each finger should turn on. If they do not, you probably have it incorrectly inserted. After the sensors are plugged in, plug the host board into the main computer. The LED should blink once, then turn on after a few seconds. If it does not, it is usually a sign that the I2C lines are somehow scrambled due to a damaged wire or conflicting finger addresses on the same bus. Finger board 7 [35,36,37,38] This is a spare board, in case of any difficulty installing, etc.